“Vat ever happened to my Transylvania Twist?” The age-old question is finally addressed. 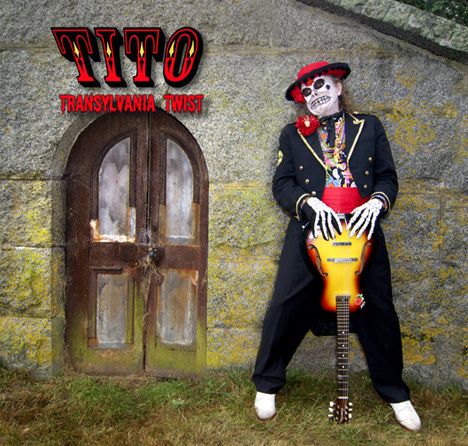 Tito’s new album, Transylvania Twist includes original songs about Classic Horror Monsters of the 1930s – sung in a doo-wop style! Transylvania Twist is full of life, energy and fun tunes about Frankenstein, the Mummy, the Wolf Man, the Invisible Man, the Bride of Frankenstein, King Kong and Godzilla. Dracula is also included – he sings the title track that was mentioned in Bobby “Boris” Pickett’s “The Monster Mash”. Anyone old enough remembers the famous vampire’s line, “Vat ever happened to my Transylvania Twist?”, from the 1962 hit. And the answer is right here in Tito’s new album. The collection opens its castle doors with “The Tale of Frankenstein,” a fitting and timely tribute to the world’s most popular horror monster. 2018 was the bicentennial of Mary Shelley’s novel “Frankenstein,” created exactly 200 years ago. 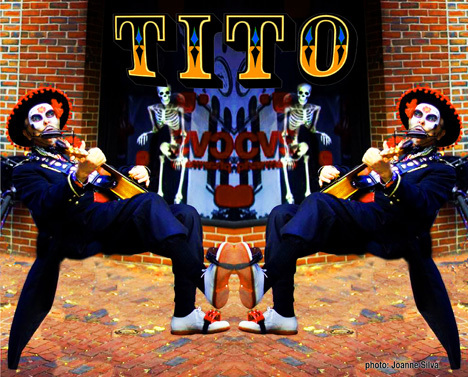 Tito’s song makes reference to at least three films on the subject – Frankenstein (1931), The Bride of Frankenstein (1935) and Young Frankenstein (1974). “Invisible Man’s Mind” is pure doo-wop with its rhythmic background vocals chugging along behind the falsetto lead. It is reminiscent of The Silhouettes’ 1957 hit “Get A Job” – energy and a ton of fun singalong vocals. The original film featuring Claude Rains (well, at least his voice) was released in 1933. Track 3 “Superstar Hairdo” might be the most excitingly creative venture into the reality of Dr. Frankenstein squirming with what to do about the hairstyle of his second human creation, the Bride of Frankenstein. Seems the good doctor knew a lot about piecing body parts together, but when it came to the hair, he needed to outsource the job. Hence a phone call was made to a salon… and here lies the basis of the dynamic song with the flamboyant touch of master violinist Eric Lee (recorded by the equally famous Jim Henry). “Shave the Wolfman” is a modern statement in a cappella doo-wop form about the Wolfman not being that different than your everyday guy. If he was shaved, maybe he would fit right in. Are all men as aggressive as a wolfman? Maybe you should check your guy for the tell-tale signs… Hairy back? Hairy legs? Has he been growling lately? The original film starred Lon Chaney Jr. in 1942. The title track “Transylvania Twist” is Dracula’s attempt at creating a new dance that has women exposing their neck for the expressed purpose of donating a little blood to his cause. Dracula admits it wasn’t a great dance because he kept losing female partners. The 1931 vampire film Dracula starred Bela Lugosi. Our friend the Mummy (from the 1932 film) was a strange threat. He had been wrapped up for 3,000 years and did not have much mobility, so why did his victims have such a hard time avoiding him? That is the subject of this song, “Mummy Drag”. Tito loves the Mummy but has to admit that the guy was pretty slow. The end of the disc brings us to an energetic high point, with Tito ripping off the rhythms and chants of the Isley Brothers’ 1959 booty-shaker “Shout”. But Tito turns “Godzilla Gotalota Singabout” into a rhythmic call and response party-maker. At the peak of the song, Godzilla crashes the party, and steps all over the city of Tokyo. The coherence and consistency of quality in the release was insured by producers T Max and Greg Dann at Rockpile Recording in Rockport, MA. Any album that can put a smile on your face multiple times deserves to be heard by everyone. Here are links to three video from Transylvania Twist…. I am looking forward to hearing this album which I am sure will put a smile on my face.T Max is a very talented guy!! Love the cover photo too.